A prominent proto-fascist French politician addressed the biggest annual conservative conference in the U.S., and she decried LGBTQ equality. Marion Maréchel-Le Pen – the granddaughter of Holocaust-denier Jean-Marie Le Pen and the niece of far-right gadfly Marine Le Pen – was invited to speak at the CPAC just outside D.C. She talked about the European Union, taxes… and attacked LGBTQ rights. Not only is she against LGBTQ rights, she is also a little wacky. Maréchel-Le Pen cited “Manif pour tous” – the organization that mobilized protests against marriage equality in France several years ago – as an example of the right’s recent successes. Unlike the other two, Manif pour tous failed. Marriage equality passed the national legislature in 2013 with almost 60% of representatives voting in favor of it. It’s a bold move for CPAC to invite Maréchel-Le Pen. Her grandfather founded the National Front, the far-right party that both she and her aunt were part of. Jean-Marie Le Pen was known for his extremist views and was prosecuted twice for Holocaust denial. He also wanted to imprison people living with HIV/AIDS, claimed that numerous mainstream politicians weren’t truly French because they were either part Jewish or “bought” by Jews, and even criticized the French World Cup Soccer team for not being white enough. Marine Le Pen, though, tried to tone down her father’s rhetoric. She got second place in the 2017 presidential elections by keeping quiet about the Jews and putting gay men in prominent campaign positions, trying to unite various groups under a banner of Euro-skepticism and Islamophobia. Maréchel-Le Pen, though, marched with “Manif pour tous.” In her five years in the National Assembly (the legislature’s lower house), she sponsored only four bills, including a constitutional amendment to ban marriage equality. Unlike her aunt, she doesn’t say the anti-LGBTQ parts quietly. 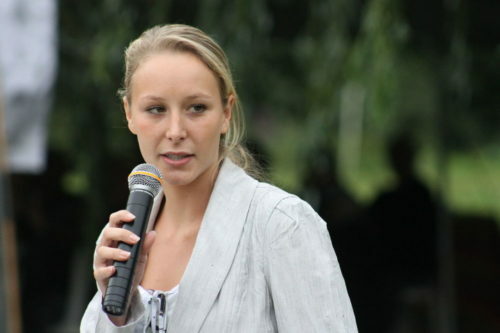 “Marion is a far-right nationalist like her grandfather, and it’s precisely because Marine tried to distance the party from the toxic image of Jean-Marie, to become more mainstream and attract working-class voters, that she opposed her,” the Hudson Institute’s Benjamin Haddad said. On the surface, it’s not really clear what a French politician can add to a meeting of American conservative activists and politicians, especially since the right loves to say that they don’t care what other countries do because America is exceptional. But the patriotism has never been the point of movement conservatism. Instead, they just use jingoism as a tool to advance their agenda. Maréchel-Le Pen is white and hates the right groups of people. That’s all that’s important for America’s right.